A baselayer insures you stay dry by pulling sweat and moisture away from your skin, and provides insulation, as it is the layer closest to your skin. The Merano is a stretchy, thermal base layer with an ergonomic cut that is comfortable and agile, allowing freedom of movement without feeling restrictive. Topped off with a softshell jacket or long sleeve jersey, the Merano's seamless fit hugs without tugging, making it an ideal second skin to keep you warm, dry and comfortable in winter. 72% polyamide 20% polypropylene 8% spandex Thermal Seamless Quick dry . In the end, you could hardly recognize the BIONIC Energizer anymore The philosophy of X-BIONIC products, like the BIONIC EnergizerMK2 aren't just replaced, rather they are constantly improved. X-BIONIC Swiss textile engineers needed months and months in the research laboratory together with the X-BIONIC performance athletes. Madison Cycling MTB Isoler Mesh Women's Base Layer - Size 8 - Blue -CLEARANCE! Do not bleach. Do not tumble dry. Machine wash cold. SIXS Carbon Underwear short-sleeve round neck jersey, a multi-sport product ideal in all conditions. Unlike the sleeveless model, the sleeve hugs the upper part of the arm (armpit) which is subject to copious perspiration and keeps the skin dry. The lightest and most breathable polypropylene fiber on the market combined with a real carbon yarn that provides heat transmission and antistatic properties that protect the body from the electric charge caused by rubbing multiple synthetic fabrics against each other (condition typical of sports clothing). Rapha Prestige rides are team events across stunning terrain. 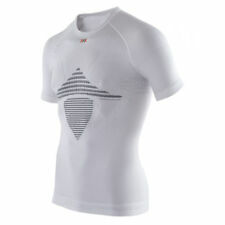 To celebrate the rides, this special-edition base layer features the design from the Rapha Prestige series. From Rapha NB: The Pro Team Base Layer sizing is race-tight. Soft materials with a smooth structure embrace the skin with a gentle, cozy touch. Sleeve Style Long. Video will open in a new window[isdntekvideo]. Color Black. Defined Color Black. We owe it all to listening to you. The Vesta base layer is constructed from a lightweight, stretch mesh that keeps your body dry as it wicks moisture from your skin to the outside of the garment. Specifically designed to keep you feeling cool and dry in warm conditions. Seamless mesh base layer top Transfers moisture quickly away from skin Soft material feel Lightweight garment Works well in warm and cold conditions 2 different mesh patterns allows better ventilation Keeps you dry and maintains body temperature 66% polypropylene 24% polyamide, 10% Elastane . SANTINI 365 LADIES SPORTS BRA BASE LAYER FOR CYCLING AND RUNNING - PRICE CUT! Model: Long Sleeve Base Layer. Color: White. Good Luck and CRANK ON! Item Condition Item Details. SIXS long-sleeve round neck base layer made of the Carbon Underwear fabric that lets the skin breath and ensures thermoregulation of the body in any weather condition (outdoors or indoors). The long sleeve hugs every part of the arm to keep the skin fresh and lies between the skin and a top garment. It also slightly protects against cool drafts if a short-sleeve top garment is worn. Thin lightweight and elastic fabric that is channel-knitted with two high-tech polyester fibers. Soft materials with a smooth structure embrace the skin with a gentle, cozy touch. 70% Polyester, 30% Polyamide. Sleeve Style Long. Video will open in a new window[isdntekvideo]. We owe it all to listening to you. Short sleeve. One photo used for all the different sizes. Base Layer Lady Windstopper Shirt. Gore Bike Wear. Bust - 18”. Short sleeve. Machine Washable. Sleeve - 5”. Length - 26”. This is a new Craft Cooling Concept baselayer. Short sleeve. Size large.